Aquaman‘s undersea kingdom keeps expanding. Earlier today, Heroic Hollywood showcased two new images of giant underwater creatures that are ready to battle for the fate of Atlantis. William DaFoe’s Vulko is depicted in the first image, as he rode an armored hammerhead shark through the ocean. Vulko is a political power player in Atlantis. He also influences the leaders of Atlantis in their decisions. In the comics, Vulko has been both Aquaman’s friend and foe, depending upon his needs at the time. Consequently, it’s unclear whether DaFoe’s Vulko will provide support for Jason Mamoa’s Aquaman or emerge as an enemy. Next, Aquaman’s half brother, King Orm, was the subject of the second photo from Heroic Hollywood. The king rides in style atop an armored tylosaur. Patrick Wilson will play King Orm, also known as Ocean Master. The two brothers will battle over who is the rightful king of Atlantis in the major conflict of the movie. Who will emerge on top? The full blooded Atlantean or the prodigal son from the surface world? Vulko will no doubt have a vested interest in the winner. The prehistoric tylosaur was about 40 feet long and its cousin the mosasaur has been seen in the recent Jurassic World movies. Think of that size beast with an Atlantean king controlling it. That image is enough to put the fear of Neptune in anyone, even Aquaman. Every new image promises more surprises from this under explored corner of the DC Universe. 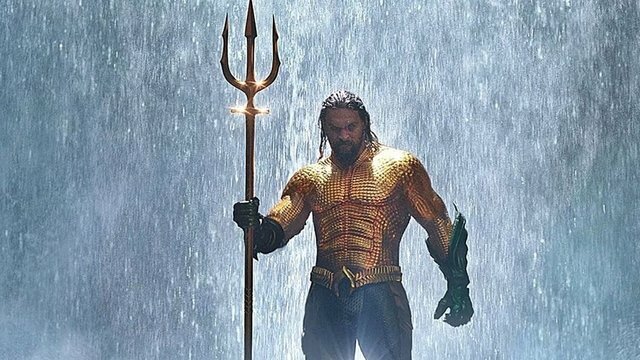 What would you like to see show up in Aquaman? Do you trust Vulko? Let us know in the comment section below.